Nana Life: A Big Thankful Thursday! Let me just jump right into a big Thankful Thursday post... I'm just bubbling over with good stuff! 1. Health insurance - my last doctor visit was over $800. I paid nothing. My ear drops today were $145. I paid $10. I am grateful to have health insurance. For a long time I did not. 2. Life insurance - this is my big ticket item. I sell stuff for a living. Yes, I make a base salary but it's selling stuff that makes it possible for me to live a better life. I've been beating the bushes all week trying to sell life insurance and today I sold two policies. God is good. One of the policies was to a single dad with three kids - I felt good knowing that there was some money to be left for his kids if something should happen to him. 3. A sweet man who put a big grin on my face last night that lasted through the day today. Can I just tell you how fabulous it feels to have reconnected? I can't wait to see him... I suspect it will be an emotional reunion but I'm so glad he waited for me. When I saw him last summer it was hard... there was so much I wanted to tell him but the time wasn't right. I was caught between two worlds. I think that's how I felt a lot of the time in Jacksonville. I never belonged there... but I didn't have a home here any more. 4. Truth. It has a way of rising to the top, proving itself, separating from fiction. I embrace truth. I celebrate truth. Truth is what has taken me from being "paranoid" to having my suspicions validated. Truth is what has cleared my mind, lowered my blood pressure, given me strength, fixed my broken heart. 6. Small towns. I list this one a lot but I still really love this little place. The doctor Austin and I saw this morning was at the performance of the high school Christmas play this afternoon. That's small town for you! And she remembered him... which he really enjoyed. 7. A full pantry/full refrigerator. Money is tight this weekend. I'm so grateful that I stocked the pantry! I opened the refrigerator tonight and found a leftover hamburger and potato... we have a weeks worth of good meals waiting for us. We can stay in and eat good! I never used to cook and now I'm loving it. 8. Email friends. I chatted with Whitney (from Jacksonville) off and on all day today. I chatted with another friend or two as well. Yes, I'm working *wink*... but it's nice to have that contact with the outside world while I'm working. 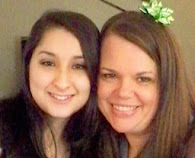 Whitney celebrated my life sales with me in a way that most people don't get (she's an awesome salesperson!)... you guys have celebrated my mushy rekindled romance in a big way... and a lot of you even remember when he was a part of my life before. That's just awesome! 9. Little kids. My Jamie gurl was just a doll last night. I was sitting at a table waiting for dinner to start at church... she came over - just as excited to see me as I was to see her - and did her little thing where she leans into you and allows you to hug her but doesn't really hug back. After dinner we hung out a bit until time for her class and mine. It's so good to be a part of her life. 10. early bedtime. I was out at the Christmas party Tuesday night. I was out in the cold rain to go to church last night. Tonight I'm curled up in my nest in my big comfy sweats and I'm about to make use of those high dollar eardrops! I am so glad that you had a good week. I wish I had ins. man let me tell you it would make my life easier. Lots of big thankfuls! Even the small blessings lets you know Gods hand is in everything! What a wonderful list! Can 'see' your smile in all of your words. Coming at this time of year, it could be the sign of a super cool start to the next year! Momentum ... let it the good times roll on!! this is such a lovely list. you go girl!! !